We’d love your help. Let us know what’s wrong with this preview of The Innocent by Willowy Whisper. "I wonder who would shoot a girl so young...?" The question haunted him as he left the river and her grave behind. Someone destroyed the evidence. Someone had to kill to keep her fr "I wonder who would shoot a girl so young...?" The question haunted him as he left the river and her grave behind. The book jumps right into the action. While our main character, Harvey, is investigating, Willowy g I have never been a big fan of Western books. The book jumps right into the action. While our main character, Harvey, is investigating, Willowy gives us little hints to unravel ourselves. If you pay attention, you can figure it out before the characters do! I sort of did, although it was more like a very, very strong guess. ;) And I was right! 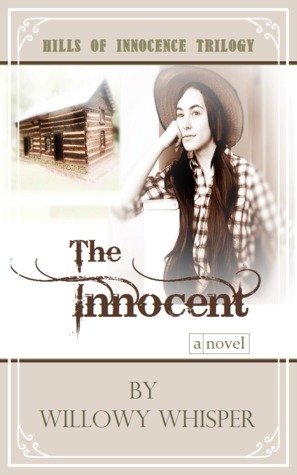 The Innocent (Hills of Innocence Trilogy #1) is a Christian-fiction, romance, western, and murder mystery novel. Intended for ages 13 and up, but appropriate for any age, although there is some violence and kissing. This book. Hm. I have mixed feelings on it. The main issues I had were the typos, while occasional, were still there, and some historical inaccuracies. I also feel like for such a short book, it dragged some. I also didn't like the emphasis placed on physical attraction. That part bothered me, as well as the lack of chaperones, which I know was kind of inevitable. I liked the character of Harvey, especially his relationship with the little boy. (Jimmy? I can't remember his Star rating: 3.5 stars. I liked the character of Harvey, especially his relationship with the little boy. (Jimmy? I can't remember his name). I also loved Brock. <3 I knew instantly he couldn't be a possible suspect. I will give kudos to the author for the plot twist in the end! I am usually pretty good at unraveling the mystery well before the end of the book, but this one surprised me! And whoa!!!! The bad guy (I wont tell you who, for obvious reasons) was WICKED!!!! Good grief! My only reason for taking a half-star off the rating would be the romance. There was nothing in the book that wasn't clean, but some of it was a little too much for me. Some detailed kissing and, also, one scene where the guy is shirtless and the girl is discreetly watching him. "He lost his gal. That does something to a man. It brings out a side of him that not even he knew he had." I never, in all my life, thought I would read a murder mystery and finish it with this thought: "Aww, that's so sweet!" I was given a free copy of this book in exchange for this review and I must say it was totally wor I never, in all my life, thought I would read a murder mystery and finish it with this thought: "Aww, that's so sweet!" I was given a free copy of this book in exchange for this review and I must say it was totally worth the trade. Harvey West is given a month. One month to prove his innocen Originally posted on Reveries Reviews. And the someone isn't afraid to kill again---no matter what the cost. The characters were well-developed and interesting. I especially liked Harvey (such a good guy! ), Brock (adorably sweet), and Jimmy (also adorably sweet ... in a different way). Joe was interesting, as well, and Clyde was (view spoiler)[evil, of course. But still well-developed. I admit she fooled me about him at first! (hide spoiler)] I was a little irritated at Abigail once or twice. I was like, "Do you have handsome, sweet, understanding cowboys walk into your life and spend weeks trying to discover who killed your sister every day? No? THEN BE NICE TO HIM FOR CRYING OUT LOUD!" But I understand why she acted the way she acted, and I forgave her. Besides, I am even more stubborn than she is, so ... what am I complaining about? It's like the pot calling the kettle black. There wasn't really a lot of room for improvement here. I wish there could have been a little more description, however. I'd like to know about how every character looked like, what the houses look like, etc. Description can be sneaked in almost anywhere without massive blocks of it, and I think it would have added to my mental imagery. I'd also like to know what Rascal looks like. I've been imagining him as black or bay. Am I close, Willowy? As far as sexual content, there were quite a few kisses/mentions of kissing. A couple were described (mostly just talking about emotions). Some of these kisses (not the described ones, though) were between a man and woman who didn't end up getting married. Not recommended to children under 12 (upper PG). However, after that, I wouldn't have an reservations (unless you're sensitive to that kind of thing). An amazing story that I couldn't put down in places with sweet characters and a suspenseful plot. It's really a great book (despite my criticism on certain points ... sorry, I can be very harsh!) and I hope to read more by the author (and about these characters) in the future. The Innocent begins when Harvey West finds a girl killed by the creek. It follows his journey to prove his innocence when all evidence seems to point to him as killer. There were many likeable characters. My personal favorites were Jimmie and Brock. From what little western research I've done, it seems very much in line with how trials and proving in I was given this book in exchange for an honest review. From what little western research I've done, it seems very much in line with how trials and proving innocent went--every man for himself. This is honestly the first "murder mystery" that I've ever read and overall, I think this would be considered a "clean" book with no language and little violence; though there was a bit of romance and kissing. The very first scene that put me on edge was when Abigail stumbled across Harvey bathing in the stream. Her focus was drawn to his physique. Very good suspense, it takes hold of you, forcing you to find out what happens, and finish! The author did a great job of writing it and forming the mystery. You sure don't have a clue about anything until it comes out in the open. Terrifyingly exciting when you don't know what is going to happen next! Too much romance, like most books though. :( If you want a book just for the mystery it is great. I would prefer a book with less romance though. However, if you want to skip over those parts - i Very good suspense, it takes hold of you, forcing you to find out what happens, and finish! The author did a great job of writing it and forming the mystery. You sure don't have a clue about anything until it comes out in the open. Terrifyingly exciting when you don't know what is going to happen next! 4 stars. I really enjoyed The Innocent! Harvey was an amazing character to read about- it was so inspiring to read about how his faith impacted what he did, and how it strengthened him as the story progressed. Although I didn't love Abigail at first, I loved watching how she grew and matured. There are gunshots and kisses mentioned, but they're all barely detailed. There are mentions of people cursing, though the curses aren't written. Nothing really stood out to me as a red flag, so I'd say the 4 stars. I really enjoyed The Innocent! Harvey was an amazing character to read about- it was so inspiring to read about how his faith impacted what he did, and how it strengthened him as the story progressed. Although I didn't love Abigail at first, I loved watching how she grew and matured. There are gunshots and kisses mentioned, but they're all barely detailed. There are mentions of people cursing, though the curses aren't written. Nothing really stood out to me as a red flag, so I'd say the content is appropriate for ages 12+ (Willowy recommends 13+). I did find the story to be less polished and edited than it could have been (examples: typos, some scenes didn't really match with the overall flow of the story, inconsistent writing tenses) , so that's why I'm docking a star. However, I have read some of Willowy's more recent works, and I absolutely loved them and her writing style, so I would still 5/5 totally recommend her books. I really enjoyed this book and read it in one sitting!! It kept me on the edge of my seat on every page and I was so desperate to know what was going to happen! I loved the characters and the author did a great job with Abigail. She was flawed like the rest of us and very relatable. The whole thing with Brocke was so sad. I felt so bad for him. All in all, it was a great story! This was a very enjoyable mystery that kept me guessing! The characters were all very endearing, especially Brock, in my opinion! ;) The opening bit got my attention immediately, and I was caught up in the story. The only reason I'm giving this 4 stars instead of 5 is because I felt uncomfortable with a few of the scenes. There was nothing inappropriate, but it still put me on edge. There was also the fact that there was quite a bit of kissing with a guy Abigail didn't end up marrying. (I'll let This was a very enjoyable mystery that kept me guessing! The characters were all very endearing, especially Brock, in my opinion! ;) The opening bit got my attention immediately, and I was caught up in the story. Again, there was nothing inappropriate, this is more just because of my personal convictions. I really enjoyed this book! It was well-written, the mystery was exciting, and the romance (well, the one that worked out) was sweet. My favourite parts were the ones with Jimmy, the little "Indian chief" that befriends the main character Harvey. I would have liked further details about the characters and their background stories, since I didn't feel like I learned a whole lot about the characters throughout the story than what was already presented in their first descriptions (except for the mu I really enjoyed this book! It was well-written, the mystery was exciting, and the romance (well, the one that worked out) was sweet. My favourite parts were the ones with Jimmy, the little "Indian chief" that befriends the main character Harvey. I would have liked further details about the characters and their background stories, since I didn't feel like I learned a whole lot about the characters throughout the story than what was already presented in their first descriptions (except for the murderer). So I guess that I wish the book was longer to fit that all in! It was full of mysteries. I love how the whole thing turned.... Perfect for teens and young adults and women, more for women.